Could you survive without clean water? - Have you wondered what would happen if you ran out of water? - Do you ever go camping, hiking or backpacking? - Do you have a bug out bag for emergencies? Get all of the benefits of a heavy duty water filter, at a fraction of the size and cost. - Chemical Free technology for healthy water intake. - Lightweight and easy to store. Perfect for Bug Out Bags. With my son in Boy Scouts and my husband and son both camping a LOT, we have started being more aware of emergency supplies that are necessary to have on hand for different outdoor scenarios. Between disaster planning, emergency supplies and first aid supplies, we are frequently looking for good quality products to have for scout outings and family emergency needs. Now, we are not true "preppers" yet, but are working towards trying out and acquiring items needed to keep our family healthy and safe during nearly any situation. Clean drinking water is one of the top 4 Necessities of life. Being in emergency situations or on a camp out or hike, running out of clean water can be life threatening. Having a safe, quick option to get clean drinking water is a must - plus it must be lightweight enough to carry in a hiking backpack. 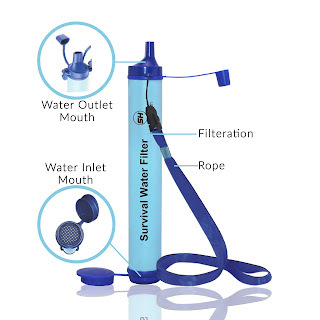 With this Survival Water Filter, we have a lightweight, easy to pack/carry filter that will clean up to nearly 400 gallons of water with each filter. I am amazed by how well it works. Since it did not arrive before my son left for Scout Summer Camp, I had to try it out in a unique way. I took fresh dirt from a potted plant and stirred it into clean bottled drinking water. I then used the filter to "drink" from that dirty water - since I needed to prove it was clean - I spit out the water into another glass so I could see and take a photo of the water after it had been through the filter. Not only is there no dirt, but the water has no taste - I mean some bottled waters have a sort of "taste" to them, but this water was just clean and refreshing. This filter is definitely going into our camping supplies, and we will be purchasing a few more for our emergency kits as well! This blogger HIGHLY recommends this survival filter! Check it out for yourself on Amazon. 1. Do you have an emergency kit for your family? 2. If no, are you thinking of making one? 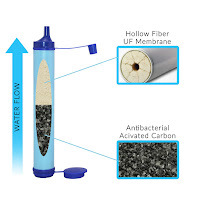 If Yes, do you have a type of water filter included? 3. What appeals to you about this Survival Water Filter? Disclosure: I received free the item(s) mentioned in this post in exchange for my honest review. Regardless ~ All my reviews are my honest and personal opinion through Tomoson . I am disclosing this in accordance with the Federal Trade Commission’s 16 CFR, Part 255: “Guides Concerning the Use of Endorsements and Testimonials in Advertising.”.